To celebrate my birthday last night, I went with a couple of friends/colleagues (Atlanta for work) to a show at The Masquerade, which is an old mill turned music venue. We had a blast exploring the different three levels cleverly named Heaven, Hell, and Purgatory. If you’re ever in the ATL area, you must go, no matter who is performing. The headliner, Toro y Moi is a hipster black guy who put on a great show, super chill. My personal favorite, however, was the opening band, brother/sister duo Wild Belle. The lead singer, Natalie Bergman, is this ridiculous hybrid of Adele and Amy Winehouse with a splash of Stevie Nicks. Her voice is smokey and sultry and her look is all seventies, total babe (I want to be her). It’s a such shame these two are related, otherwise they’d be the white Jay and Beyonce. 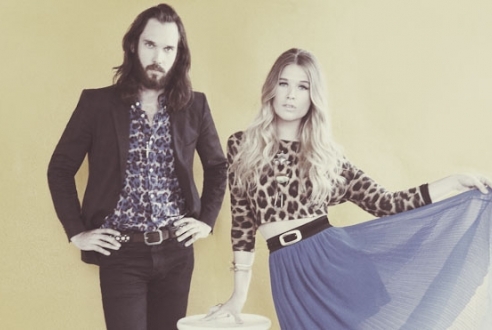 World’s coolest brother and sister, Elliot and Natalie Bergman, Wild Belle.